Romitaman Original Comic Book Art :: Private Collection :: Amazing Spider-Man 128 Cover (1973) SOLD SOLD SOLD! 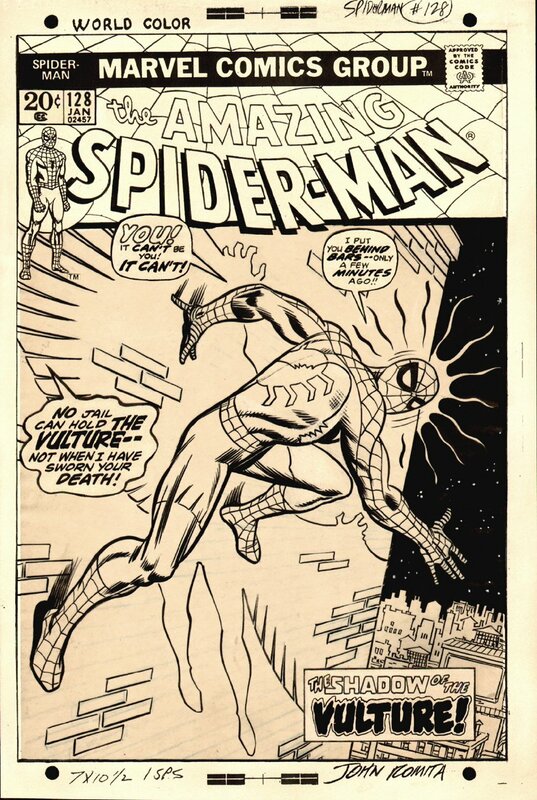 by artist John Romita Sr.
Click Here To See Amazing Spider-Man #128 Comic Book! Check out this stunning 1973 Amazing Spider-Man cover which was penciled and inked by the great John Romita, from the story titled: "The Shadow of the Vulture!" This stunning cover features the Vulture getting ready to attack Spider-Man, as Spidey's Spider-Sense is going crazy while he clings to the side of a building in shock over his foe being free form prison! The Spider-Man image on this cover is HUGE! Spider-Man takes up almost the ENTIRE drawn COVER area from top to bottom, with the shadow of THE VULTURE super-imposed on the very detailed building! The night time background and buildings to the right look amazing also! This cover was penciled in blue pencil and inked by John Romita on vellum which was then placed onto another art board. The art has slightly yellowed, but no art is adversely affected by this. The logo and word balloons were all reconstructed and match the artwork perfectly, and look great. The Vulture lasts appeared as the main villain for Spidey in ASM #64! Don't pass up this opportunity to get a 40 year old John Romita penciled and inked ASM cover featuring the 2nd super villain Spidey ever fought way back in ASM #2, and just 1 issue before..."THE PUNISHER" FIRST APPEARS! Compare this nice cover art to the published comic book in the red link above! ALL HIGH end pieces of art, including this one, are able to be purchased with VERY fair time payment plan options, and trades are always considered towards this and "ANY" art on our website! Just send us an email to mikeburkey@aol.com and we can try to work something out.